The cecropia moth caterpillar is the largest larva found in Iowa and is commonly seen in late summer throughout the state. Larvae may be seen feeding on the trees and shrubs where they have spent the summer, or they may be found "wandering" across lawns, sidewalks, and driveways. The caterpillar is about four inches long and nearly 3/4 inch in diameter. The body color is light green with a fluorescent blue tinge. On the top of the body just behind the head are several pairs of large tubercles that look like red, orange or yellow balls covered with black spikes. Along the rest of the length of the body are two rows of yellow spikes and two rows of light blue spikes. The cecropia caterpillars feed on a wide variety of trees and shrubs, including wild cherry, plum, maple, willow, boxelder, apple, crabapple, lilac, walnut, elm, birch, and poplar. During their life span of approximately 60 days, the caterpillars can devour a lot of foliage. However, caterpillars usually occur in widely-scattered, low numbers and significant defoliation damage is very unlikely except on very small, newly transplanted plants. In late summer the caterpillar spins a dirty gray or brown cocoon resembling a pod attached to plant twigs or hung between branches. The cocoon is about four to five inches long and an inch or two wide. The insect remains inside this cocoon all winter and the adult moth emerges the following May. The moth is very large and attractive, though they are seldom noticed because they are active at night. The overall wing color is dark reddish-brown. There are black spots near the outer tips of the forewings and a crescent-shaped spot in the center of each wing. The moth's body is very plump and is covered with long, rust-red hair. No control is needed for cecropia moth caterpillars. They cause very little harm to ornamental plants and encouraging their existence provides the pleasure of seeing the moths in the spring. The caterpillars and moths are harmless to people and pets. 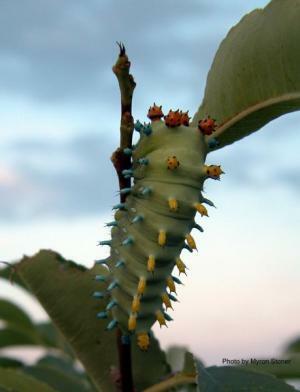 If you want to raise cecropia moths, keep caterpillars in a large container along with an adequate supply of fresh foliage from one of the plants mentioned above. A stick wedged diagonally through the rearing container will facilitate the formation of the cocoon. Cocoons that are raised or discovered outside should be left in the winter environment until late April. They can be stored in a garage or unheated porch but should not be kept in the house through the winter. There is often less than 50% success rate of moth emergence from cecropia cocoons. There are large, green caterpillars on my tomato plants. What should I do?